How Do We Measure a Vessel’s Tonnage? Gross tonnage is calculated by measuring a ship’s volume (from keel to funnel, to the outside of the hull framing) and applying a mathematical formula. Tonnage is something I’ve not yet come to fully understand. It’s a set of numbers to me that I’ve used in a relative sense. But how exactly is a vessel’s tonnage calculated? How does it vary for certain types of fishing vessels? For certain lengths? This is what I hope to be my first of several posts on this topic. The FAO entry linked above continues by giving a primer on tonnage calculation methods, not just for fishing vessels, but all vessels. In international law, as well as in practice, several systems of tonnage measurement have existed side by side. Traditionally, records of measurements of a ship’s size were expressed in tons of 100 cubic feet each (GRT); tonnage was used as a basis for taxes, berthing, docking, passage through canals, and other facilities. Thus, historically, a vessel’s tonnage was based on its volume, with 1 ton equaling 100 cubic feet, rather than the vessels weight or displacement. This is now called a vessel’s ‘gross register tonnage’ or GRT for short. Wikipedia adds that GRT was defined by Great Britain’s Moorsom Commission in 1854 and that, traditionally, you could calculate a vessel’s net register tonnage by subtracting from GRT the register tons for spaces that are ‘non-revenue earning’. Given Great Britain’s world power status, the Moorsom System became common practice. Further, the FAO implies that GRT and NRT were later codified into international law with the Oslo Convention of 1947. [T]he method of tonnage measurement has evolved and differs considerably from country to country. A number of international meetings on the subject concluded with the International Convention on Tonnage Measurement of Ships, held in London in 1969. The Convention, commonly known as the 1969 Tonnage Convention, entered into force in July 1982, though existing ships were not required to comply with the Convention until July 1994. At that time, gross tonnage, as defined by the 1969 London Convention, became obligatory for all vessels of 24 metres in length and over, and engaged in international voyages. Until 1994 the system of tonnage defined by the Oslo Convention (1947, using the Gross Register Ton GRT as unit of measurement) continued to be valid. So from 1994 onward, the international standard has been ‘gross tonnage’ or ‘GT’, which is, similarly, based on a vessel’s volume, rather than its weight or displacement. Wikipedia explains that gross tonnage is calculated based on “the moulded volume of all enclosed spaces of the ship” and, similar to GRT and NRT, there is the concept of ‘net tonnage’ or ‘NT’, which reflects just the cargo portions of the ship. The formula used to calculate GT is, in fact, quite simple. The volume is first calculated and then it is multiplied by a multiplier, which is found by a applying a fixed formula to that total volume: 0.2 + 0.02 x log10(Volume). Thus, GT has just one input variable. The formula to calculate NT is a bit more complicated and depends on three or four variables: the volume of the vessel, the depth of the vessel amidships, the vessel’s moulded draft amidships, and the number of passengers. NT is found by multiplying the vessel’s GT by another multiplier. 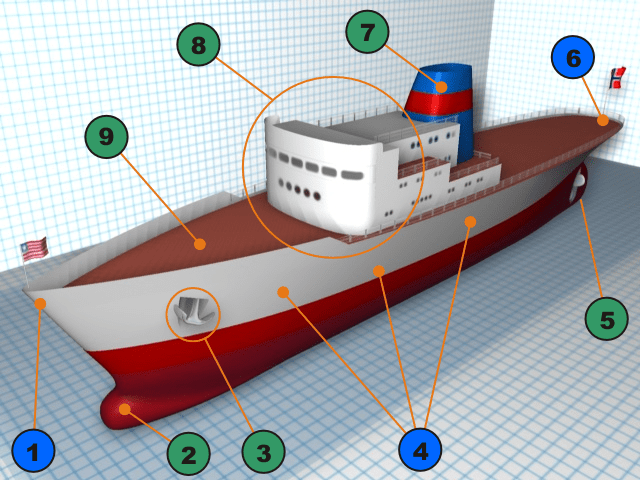 If the vessel carries 12 or fewer passengers, then that additional multiplier is: (4d^2)/(3D), where d is the moulded draft amidships and D is the moulded depth amidships. If the vessel carries 13 or more passengers, then that multiplier is instead: 4d^2. Further, with more than 13 or more passengers, an additional term needs to be added: N x [(1.25 x (GT x 10000))/10000]. As noted in the last quote from the FAO article, there’s an important caveat to GT and GNT’s use around the world. There’s standardization for vessels 24 meters or longer and/or engaged in international voyages…but not for vessels 24 meters in length or less that are non-international voyage going. That, in fact, leaves the vast majority of the world’s fishing fleet outside the London Convention’s jurisdiction. It seems that many countries instead continue to GRT and NRT as specificied by the 1947 Oslo Convention, if they use any method at all to measure smaller, non-international-voyage going vessels. The two conventions produce very different tonnage values. Although GT measurement is higher than GRT, there is no simple correlation between the two units (GT is often double the GRT, but sometimes as much as four times the GRT). The magnitude of the task of reaching international agreement on standardized measurement units, of introducing these units into national regulations, of re-measuring all fishing vessels is a very lengthy, complex and costly process. So there you have it. According to the FAO, a vessel’s tonnage is primarily, if not entirely, based on its volume and it is likely that a tonnage is “the most important single variable influencing fishing capacity”. Unfortunately, for the purposes of comparison, there are two major measurement systems – one old and one new – and it’s difficult to standardize the data. From here, I’m going to see what I can do to learn about the characteristics of the global fishing fleet and if there’s any data on vessel tonnage and length by fishing vessel type. It seems the FAO keeps this data, but I haven’t yet determined if I can access it in a useful form through their online database. It would be really interesting to see what correlation exists between vessel type and length as well as between vessel type and tonnage. The moulded draft for NT calculation can be easily determined if a vessel is subject to the International Convention on Load Lines (i.e. international going cargo vessels); such vessels must use the draft value based on their summer load line as determined by the convention (or summer timber load line if carrying timber). The same goes for international voyage going passenger vessels, which are subject to the International Convention for the Safety of Life at Sea; such vessels must use the draft value based on the deepest subdivision load line assigned by the treaty. If neither of the treaties apply to a vessel, then a moulded draft value assigned by the national government is used. And if that doesn’t exist, the draft is assumed to be 75 percent the vessel’s depth amidships, otherwise noted as ‘D’. In the case of international-voyage going fishing vessels, it seems the moulded draft would need to be set by the flag state or the 75 percent rule would be applied. Plenty more detail here, if it so pleases you. I’d be curious what the relationship is for other types of boat (since this was just for tuna purse seiners).